Demon Chutney !!!!! Wondering what this is? 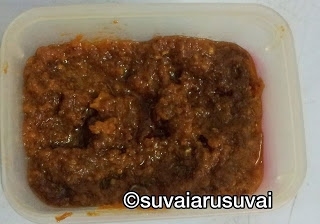 Though I know the making of this chutney for quite some time, I have been reluctant to make it for the fear of its spiciness. But when I saw this recently in a TV serial while browsing the channel, decided it is high time, I try this. In the serial it was ground in Ammi Kuzhavi. Honestly speaking, though I have tried grinding things in this, I was not able to do it the right way, ending up hurting my fingers. So ended up using our own modern kitchen equipment the mixie. The name Demon Chutney was given by my daughter, after she tasted it. Grind Garlic, Red Chilly, Tamarind and Salt together to a fine paste. Heat a pan, add the gingelly oil, heat it and add it to the ground paste. Serve it with Idly, Dosa or Chappati or even curd rice.